Discussions Magazine Music Blog: STEVE FORBERT/Alive On Arrival & Jackrabbit Slim: Special 2CD Anniversary Edition Available NOW! 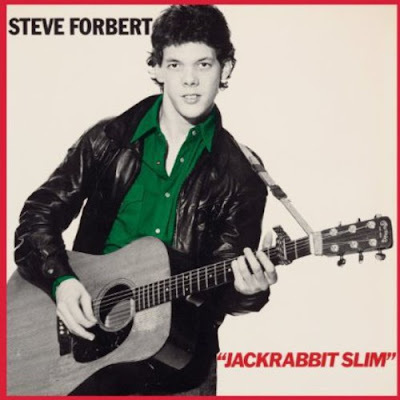 STEVE FORBERT/Alive On Arrival & Jackrabbit Slim: Special 2CD Anniversary Edition Available NOW! 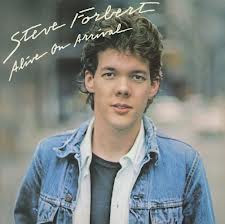 Ah, Steve Forbert... 35 years ago, he was lauded as 'the new Dylan'... which was a ludicrous tag to shackle anyone with. First off, there had already been roughly 314 'new Dylans' since the old Dylan released his debut album in the early '60s. While a few of them (Donovan in particular) had achieved success, the others were swept aside when the next 'new Dylan' came on the scene. It seemed that every singer/songwriter who played an acoustic guitar and blew into a harmonica was destined to be labeled as the next 'new Dylan'. And how many guitar-led bands were saddled with 'the new Beatles' tag over the years? Even the Bay City Rollers were once called 'the new Beatles' but we all knew that they were really 'the new Bo Donaldson & The Heywoods'! As for Steve Forbert, he deserved to be called 'the new Forbert' and left to his own devices. Judging by his recorded output, he was (and is) an extremely talented and unique artist who unfortunately spent the first part of his career trying to shake the 'new Dylan' tag and move on. Now, 35 years after his debut album, Alive On Arrival, Blue Corn Music has just released a special two CD anniversary edition that not only contains an expanded version of that debut but also an expanded version of his even better sophomore album, 1979's Jackrabbit Slim. Both discs combined contain enough bonus tracks to make a third album... and that makes this set an absolute must-have for Forbert, Folk Rock, singer/songwriter and 'new Dylan' fans. For the uninitiated, this set is the perfect introduction to the world of Steve Forbert. Alive On Arrival is the album that started the ball rolling. With warm production and Forbert's intimate performances, the album heralded a new talent that, on first listen, didn't seem to fit comfortably in any one genre. Sure, it's a Folk-centric album, but there's also many other influences floating around including Pop, Rock, Country and Gospel. Some of those influences make themselves known in a chord change while other times, it's in the subtle nuances of the players involved. The bonus tracks are certainly the equal of any of the album's tracks... yes, they are that good! Their presence does not distract from the flow of the album: in fact, just the opposite. They actually enhance the album and add to it's magic. Alive On Arrival is a timeless album that still sounds fresh, even at a time when the market is over-saturated with singer/songwriters. In the late '70s and early '80s, nearly two years between albums seemed like a lifetime. Most bands rose and fell in that amount of time. But then again, most bands didn't release a sophomore album quite as wonderful as Jackrabbit Slim. Still traveling the same musical ground as the first album, Jackrabbit Slim upped the ante in terms of melodies. Alive On Arrival certainly had plenty of them as well, but this sophomore rekkid was more immediate and more satisfying if you were in search of a tune to hang your heart on. And the bonus tracks? Pure gold. "The Oil Song" was actually on a 7" EP that came with the album, so I remember wearing out the grooves on that one... which wasn't hard since the song was 6+ minutes in length and cramming that much music onto one side of a single left a lot to be desired, sound quality wise! Forbert recorded two more albums for Nemperor Records (Little Stevie Orbit and Steve Forbert), neither of which have ever appeared on CD. I have no shame in stating that I will salivate uncontrollably if ever they are released. In fact, his final album (the self-titled one) has a few of my favorite Forbert songs on it! So, anyway, why aren't you rushing out to grab this 2CD set right now? By all means, either grab your coat and head off to a hip record store or click on the links I've provided. You won't be sorry. Great article! Steve's third and fourth albums (Little Stevie Orbit and Steve Forbert) were released on Rolling Tide records and can be purchased from steveforbert.com for $10 a piece. Thank you for that info. I've just purchased them! I can't believe that I never knew they existed on CD! Hmmm.... I wonder what else I've missed in the land of CD reissues!